On An Overgrown Path: Which is the eccentric yet always interesting composer? Which is the eccentric yet always interesting composer? One programme included the second and third movements of Mahler’s Sixth Symphony, and on this occasion I was introduced for the first time to the work of this eccentric, long-winded, muddleheaded, and yet always interesting composer. The restless perversity of the very individual orchestration excited me tremendously. I marvelled at the strange juxtaposition of the driest Kapellmeisterlich formulas and heartwrung melodies and harmonies which might have been the outpouring of a Promethean grief. And those gawky scherzos, ländlers, with knobs on (and indeed spikes!). These works of the oddly laboriously minded Jew are still a matter for squabbling among amateurs of the art, and I doubt if they will ever be fully understood, or even whether the composer himself had any vision in continuity of what he was driving at. 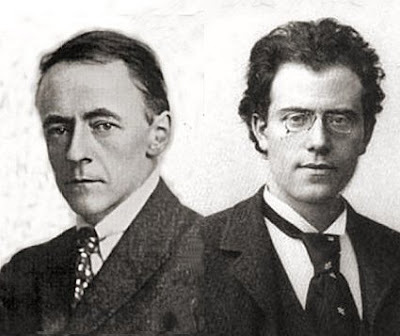 Arnold Bax, seen on the left above, writes in his memoir Farewell My Youth of a concert in Dresden in 1907. In The English Musical Renaissance Peter Pirie describes how Bax’s Sixth Symphony “tears up the earth by its roots” and Vernon Handley – whose Chandos Bax symphony cycle is one of the great achievements of the gramophone – says of the the composer's Sixth "now you are talking about a masterpiece – it really is everything to me that symphony”. And talking of sixes, 2013 is the sixtieth anniversary of Bax’s death; so surely the time of his Sixth Symphony has come?